Nicole Obenski, 34, of Philadelphia, survived colon cancer – only to have it return in December. She urges people to consult with a doctor if they notice any changes in bowel habits or blood in their stool. Nicole Obenski knew she was at higher risk for colon cancer as someone who suffers from colitis, a chronic inflammatory bowel disease. But the Philadelphia resident never figured she would be diagnosed with colon cancer at such a young age. "I always thought to myself, if I get it maybe I'll just be 60 years old," Obenski said. "I never thought it would happen at 31. It just makes me very sad and frustrated because I know what all of this entails and how it just completely crushes you and how it changes your entire world. I don't want anybody to have to go through this." The overall colon cancer incidence rate is falling in the United States, a decline attributed to increased screening rates, better surveillance techniques and greater public awareness. But research indicates higher rates among younger generations, including millennials and Generation X. And doctors are unsure why. "We think part of it is an earlier recognition of the disease," said Dr. John Daly, a surgical oncologist at the Fox Chase Cancer Center and a board member of the Colorectal Cancer Alliance. "But it's more than that. We don't really have a good handle as to what the cause is." In response, some organizations, including the American Cancer Society, now are recommending most people begin screening for colorectal cancer at age 45, rather than at age 50. Doctors continue to urge people to consult their doctor if their bowel habits change or if they find blood in their stool or on toilet paper – all possible colon cancer signs. If caught early, colorectal cancer – which includes both colon and rectal cancers – can be treated with considerable success. "One of our key messages is that you can't assume that this is nothing, that it is diet, or that you're too young to develop cancer of the colon," Daly said. The overall colorectal cancer rate has been dropping since the mid-1980s. But that decline has been driven by older adults, who account for the vast majority of new colorectal cancer cases. But a study published two years ago by the Journal of the National Cancer Institute identified a concerning trend by examining the incidence rate among varying age groups. Younger generations appeared to have a higher risk. People born in 1990 have twice the risk for developing colon cancer as people born in 1950, when the risk was the lowest, according to the study. Similarly, the risk for rectal cancer was four times greater. The researchers examined the medical records of 500,000 adults who were diagnosed with colon or rectal cancer between 1973 and 2013 – a 40-year stretch. They found that the colon cancer incidence rate for people between ages 20 and 39 increased by 1 to 2 percent each year through 2013. For people between ages 40 and 54, the rate jumped 0.5 to 1 percent from the mid-1990s through 2013. The rectal cancer rate grew by even bigger margins – 3 percent per year among 20 to 39 year olds and 2 percent among people between the ages of 40 and 54. "It's a fascinating issue, but we are very much in its infancy in trying to understand if it is the case, trying to understand why that is the case and appreciate the implications from a clinical standpoint," said Dr. Anil Rustgi, chief of gastroenterology at Penn Medicine's Perelman School of Medicine. "We want to cause attention but we don't want to cause misintention." Rustgi, a physician scientist, has published more than 200 articles on the genetics of gastrointestinal cancers. Determining the cause of this apparent increase is "difficult to tackle," he said. For one, there aren't any longitudinal or biological studies among people under age 40. It's all observational. There could be biological factors involved, he said. Perhaps younger patients have an inherited genetic mutation that predisposes them to colon cancer. But he said those factors take time to play out. Perhaps there's an environmental cause, or dietary or lifestyle factors involved. But he said an environmental cause seemingly would have a greater impact on older generations, because their duration of exposure would be longer. Until more is known, Rustgi encouraged people to follow the current screening guidelines. The U.S. Preventative Task Force recommends screening begin at age 50 in most cases. "If there's no family history, then I don't think we're at a stage yet to make recommendations about colonoscopies for patients in their 30s and 40s," Rustgi said. "However, regardless of family history, if there are symptoms that merit colonoscopy, such as potentially blood in the stool, then that symptom should dictate what should be done. That's no longer screening. That's a symptom-based measure." Colorectal cancer is the second leading cause of cancer-related deaths. The American Cancer Society estimates it will kill 51,020 people this year. More than 101,000 new cases of colon cancer are expected, as are more than 44,000 new cases of rectal cancer. About 90 percent of those cases will occur in adults 50 and older, according to the U.S. Centers for Disease Control and Prevention. But doctors urge younger people to be aware of potential signs – rectal bleeding, abdominal pain and a change in bowel habits. And don't be shy either, said Dr. Steven A. Fassler, chief of colorectal surgery at Abington-Jefferson Health. "If you have any concern, the doctor can't find you – you have to find me," Fassler said. "People think it's a little weird to talk about, even now. It's one of those things that you have to be able to talk about. If you have a problem, you have to go. Any concern, any symptom." Within the last month, Fassler said he has had to inform both a 33-year-old and a 41-year-old that they have cancer. That conversation is never fun, regardless of a patient's age. But he said it's difficult in a different way with younger patients. "It is a bigger emotional tool, I think, mostly, because where you are in your life at that time," Fassler said. "This isn't on your radar. You're not set up in your life to handle this kind of thing. This is something that (they think) happens to older people." Now 34, Obenski was diagnosed with colon cancer in January 2017, not long after an emergency room visit revealed she had severe anemia. Doctors bumped up her regularly scheduled colonoscopy, which colitis patients receive earlier and more frequently than the general population. They found a cancerous mass on her colon and later determined her Stage IV cancer had spread to her lymph nodes and abdominal cavity. "The hardest thing is it's on your mind constantly," Obenski said. "Your normal life is ripped from you. Nothing about this is normal. You struggle physically, emotionally, mentally." After eight months of aggressive chemotherapy treatment, Obenski had her colon partially removed and needed an ostomy bag. It was a rough go, she said, but she made progress. Last March, Obenski had the remaining lesions in her liver surgically removed, revealing only scar tissue. Additional scans continued to come back clear. Obenski considered herself a cancer survivor. Then December brought more bad news. The cancer had returned to her liver. And she had new spots on her bladder and ovaries. Now, she's back on chemo and praying to be a survivor – again. Still, Obenski said she has gained greater perspective on life and learned how to live in the moment. 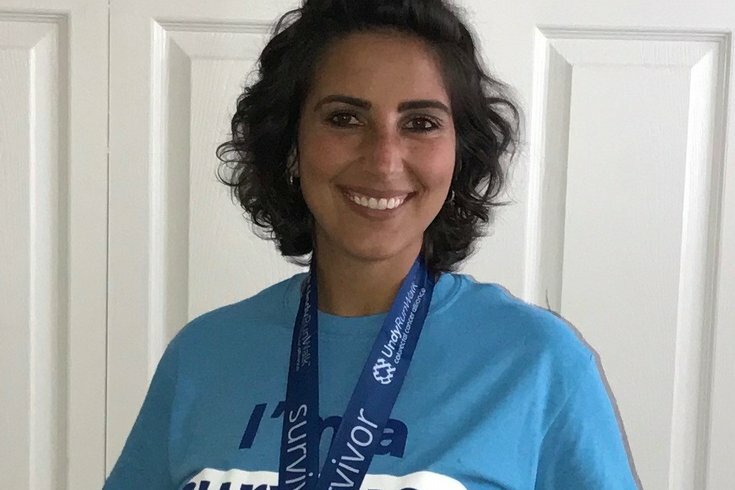 For her, that has included fundraising for the Colorectal Cancer Alliance and sharing her story publicly – all in hopes that others can avoid a bout with cancer. On Friday, the Colorectal Cancer Alliance encouraged people to dress in blue to mark the beginning of Colon Cancer Awareness Month. It's another way to help people recognize the cancer's signs. "This is on the rise (among younger generations) and we're not sure why just yet," Obenski said. "But young people need to pay attention. Maybe if people hear my story and know that I'm not 60 or 70 years old and that it can happen to young people, maybe that will drive people to get the test that they need if they're seeing any change in bowel habits."